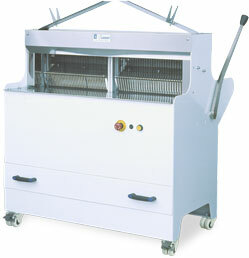 Breas slicers suitable for slice all type of breads (tinny bread, country bread, buns, loaves, etc...) Its working is silent and without vibrations, obtaining a smooth, fast and perfect cut. 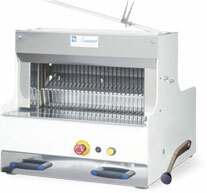 Provide a clean cut without breaking the crust thanks to its chrome-vanadium steel blades. Simple models easy to use. Table model. 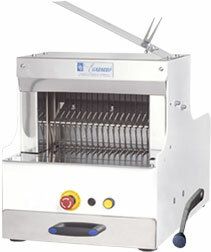 This machine is appropiate to place in shops, thanks the small sizes the machine. This model has two cutting areas to provide two differents thicknesses with the same efficency smoothness as in all our models. 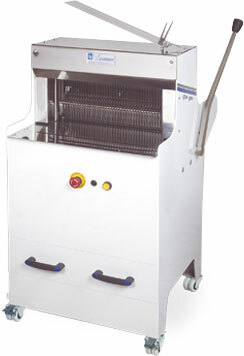 This machine provides the function of two machines in a smaller space. Equipped with two devices for baggin the bread. Lenghts of the cutting zones to distribue as you want.